CARY (WTVD) -- Do you want to spread kindness? Well, now you can and it's as simple as hiding a rock! The latest craze of painting rocks and hiding them has hit the area. It's known as The Kindness Rocks Project, and the goal is to promote random acts of kindness to unsuspecting recipients. 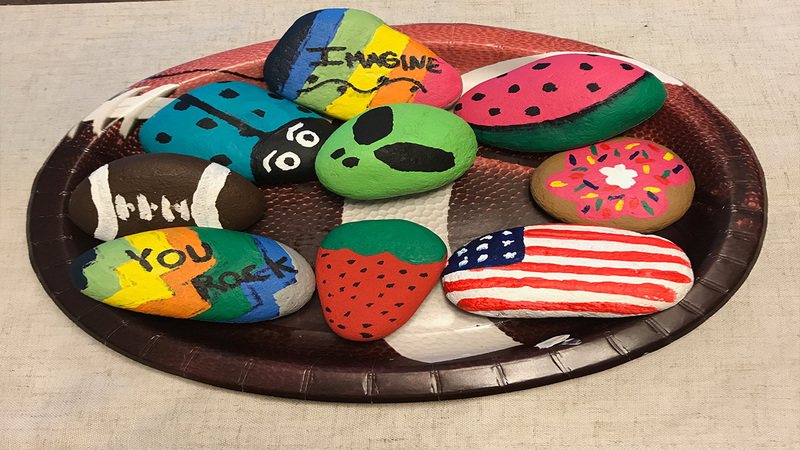 Local Facebook groups in Fuquay-Varina, Cary, and Fayetteville have formed and already have hundreds of members painting rocks and placing them in public places like local parks and outside of businesses. It's like a game of "Hide and Seek" but with painted rocks. Many of the rocks have inspirational messages painted on them, others are colorful. The rocks are meant to brighten someone's day. Once found, some people post where they found the rock and then rehide it. Seven-year-old Brooks Parker and his brother Wesley painted a bunch of rocks and then hid them throughout Cary. Brooks said he was surprised when he spotted this tiny painted rock in Bond Park. Ashley said she found this painted rock in Mill Pond Village by the Dollar Tree in Cary. And Megan Willick and her son found this rock in Holly Springs while walking on the Bass Lake Trails. The trend has become so popular that many craft stores and toy stores are selling rock painting kits. The rocks often have a hashtag with the group name so you can find that group on Facebook and then post where you found the rock. Many participants said they hide the rocks again just to see how far it travels.